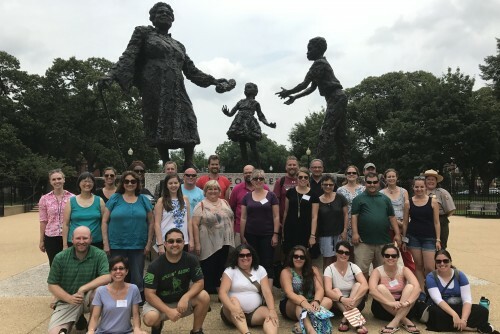 Join up to 26 teachers to examine the monuments and memorials in our nation’s capital and learn how the Civil War and Reconstruction have been remembered throughout American history. You will develop new skills and strategies to take back to the classroom, all while making lasting connections with a national network of fellow teachers and museum educators. This weeklong program is designed for teachers grades 3-12. Discover historical content to share with students. Learn how Washington’s transformation during the Civil War laid the groundwork for Reconstruction. Explore the Lincoln assassination and the trial of the conspirators and how these events had lasting implications for our military and civil justice systems. Learn about the role of Contraband Camps in Washington, the growth of historic Anacostia, the Freedmen’s Village at Arlington, and how African-American leaders like Frederick Douglass and others engaged in politics and the fight for civil liberties. Examine monuments and memorial to better understand how the Civil War has been remembered throughout history. Get hands-on experience researching and analyzing documents, speeches, images and historic sites as primary sources. Engage in the current national dialogue about monuments with fellow teachers from around the country. Learn new strategies and resources you can apply in the classroom. Learn how to facilitate a classroom dialogue about the role of monuments in your community. Discover how you can get your students on their feet performing historical speeches. Explore a variety of digital tools and resources that can help you harness the power of primary sources in the classroom. Learn how to lead nuanced discussions with your students of how our country’s history is reflected in our communities and physical spaces - and continues to impact us today. Upon successful completion of the program, participants will receive a certificate stating that they completed 37 contact hours. * Local Participants provide their own accommodations and transportation to program locations each day. * National Participant program fee includes round-trip air fare and six nights in the historic, Willard Intercontinental Hotel. * Lunch is provided daily for all participants. Applicants will receive notice via email that their application has been received. Applicants will be notified of their status no later than April 26, 2019. Stay up-to-date on teacher programs and application deadlines by joining our newsletter. To join, select “Enews for Teachers” when you subscribe. This report synthesizes the impact of the Teaching Fellows Program on teachers’ knowledge, efficacy and pedagogy and teachers’ perceptions of how their learning will impact their students’ learning. Support our professional development programs with a donation today. Participants in the 2017 Seat of War and Peace program.